Why is extra virgin olive oil good for you? I learn so much during cooking classes. 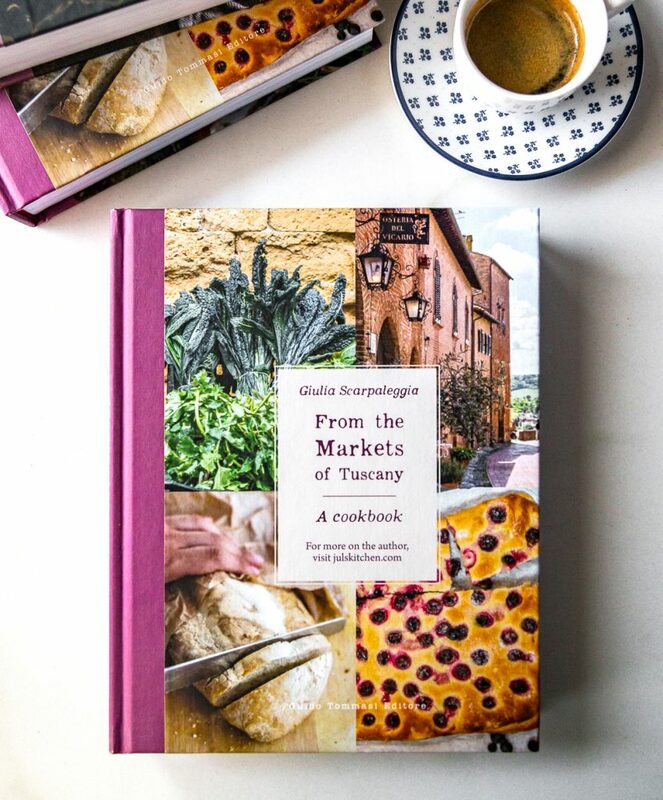 I learn about foreign food traditions, I get in contact with a different approach to life and, mostly, I can see my culture and my daily life from another perspective. Each and every student I have had in these five years helped me to think out of the box, with a refreshed approach. Their questions make me discover a new point of view on habits that I tend to give for granted. One of the ingredients that has always caused more questions and doubts is olive oil. I’ve grown up worshipping olive oil as key ingredient in Tuscan cooking, it is still my favourite one. 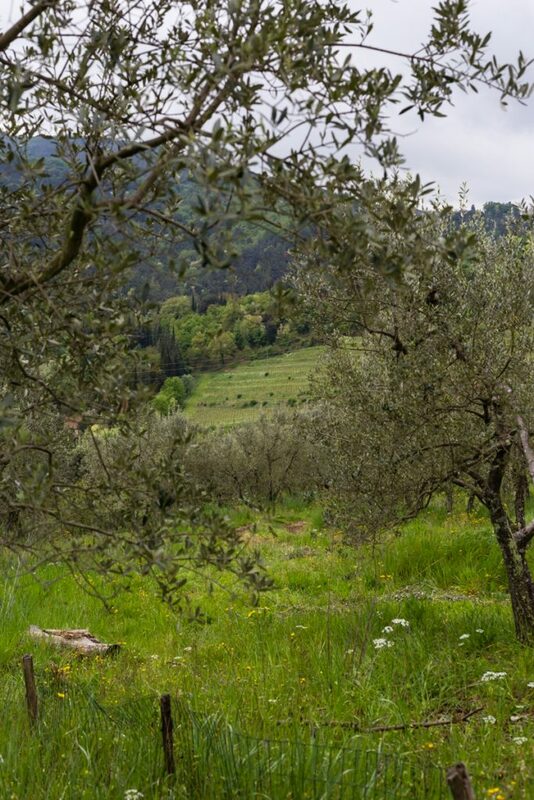 I’ve seen my parents and grandparents picking olives every year, I’ve witnessed the moment when your olives become a pure green juice at the frantoio a few times and I’ve had toasted bread rubbed with garlic and doused in freshly pressed olive oil as dinner countless time. Yet, it still mesmerizes me. I’ve given for granted uses, good habits and qualities until more and more questions during cooking classes made me pause to reflect. 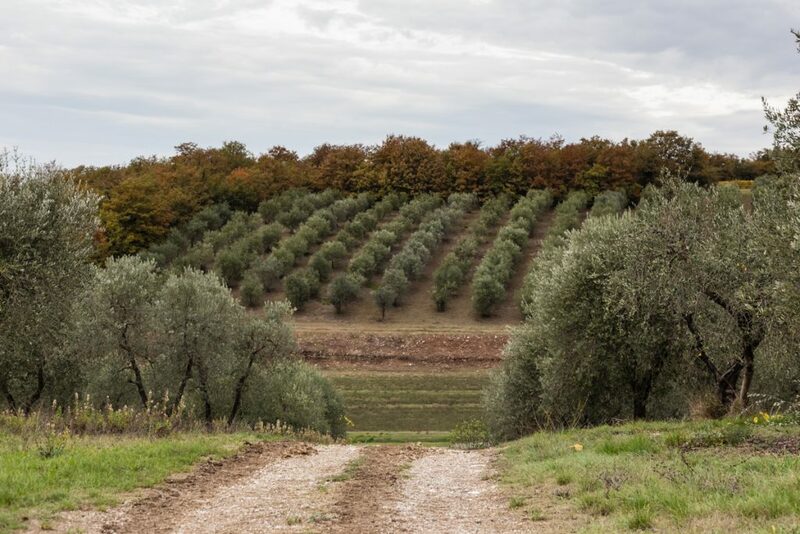 Olive groves are essential to the Mediterranean culture just like vineyards, though olive oil is still far from reaching the same importance, respect and attention of wine. Therefore, questions about the uses in cooking and frying, the role in mankind history and the benefits of olive oil are daily. I’ve written down all these questions and forwarded them to two experts in order to give you wise, fact based answers. The first expert I referred to is Claudio Peri, Professor Emeritus of University of Milan and President of the Center for Quality Studies of the Academy Of Georgofili, Florence. Author of about 300 articles in scientific journals and 20 textbooks concerning food operations and food processes; quality and safety management systems; process control and product traceability. A passionate lover of extra virgin olive oil, he authored in 2014 the Extra-Virgin Olive Oil Handbook (publisher John Wiley and Sons, UK) the most complete book in English on olive oil technology and quality. On a side note, he is also my grandma’s cousin, someone I’ve always called uncle, a habit we have in my family. I grew up looking at him with great respect as a wise, fun, interesting and generous man. His kindness, passion and curiosity shine through the following answers he gave to my questions. Extra virgin olive oil and history. What has been the importance of olive oil in the history of mankind? Ancient Greece, VII – VIII century BC, is considered the mother civilization of olive tree cultivation and olive oil use. In the fourth century BC, Hippocrates, the inventor of Medicine, mentioned many different conditions that could be treated by olive oil. The mitigatory effect of olive oil on wounds has been always recognized. It depends on antioxidant, anti inflammatory olive oil components whose composition and function have been discovered very recently. Olive oil was used also for oiling athletes to protect their skin in the harsh conditions of their competitions. However, the most important uses of oil in Ancient Greece was as a food ingredient and, most of all, as a lighting source. Since prehistoric times, light is a symbol of intelligence and divinity. This is the reason why Greeks considered olive as the sacred tree of Athena, god of wisdom, courage, inspiration, law and justice, and the arts. For the very same reason, olive oil is also a sacred symbol in the three religions of Judaism, Islam and Christianity. Being the raw material for lightening, olive oil soon became a strategic resource of Roman civilization and the object of intense commercial exchange in the Mediterranean area, from the 3rd century BC to the 5th century AD. At the same time, it was used as a condiment in foods and as a cooking medium. Olive cultivation and oil use declined sharply after the fall of the Roman Empire and the invasions by peoples coming from Northern Europe, where olive oil was unknown. For more than a millennium, olive oil was mainly used in religious rites and for lightening, much less in food. During Renaissance, an Italian and Tuscan centered period of great cultural and economic development as well as in the following 18th and 19th centuries, olive oil was considered as a poor ingredient for poor dishes of poor people. The French cuisine style dominated the culinary evolution of those periods and fats of animal origin as butter and lard were the favoured ingredients at the tables of rich and noble families. A sharp change came at the beginning of the 20th century, with the introduction of centrifugation in olive mills, replacing the ineffective and time-consuming oil-water separation by gravity. The production of olive oil increased in all the Mediterranean area both in quantity and quality. Sensory characteristics started being appreciated and considered as an indication of the oil origin and of olive biodiversity. The second important leap forward in technology as well as in oil quality was the result of the introduction, in the late seventies, of the decanter separation replacing ineffective and time-consuming pressing. The most important reason of present and increasing interest in extra virgin olive oil is the perception by consumers of its health-promoting properties. The Mediterranean diet and principles, an idea and a name invented in the US, spurred a number of researches worldwide. As an indication of the change in olive oil consideration we may cite the fact that even the high French culinary tradition is rapidly switching from animal fat to olive oil. New countries are emerging as important producers and consumers of extra virgin olive oil, including California, several South-American countries, South-Africa, Australia and New Zealand. Competition is mainly based on sensorial quality and it guarantees high quality standards. Extra virgin olive oil menus, olive oil pairings to different dishes, both traditional and new, are opening an era of further diffusion of olive oil production and consumption worldwide. Extra virgin olive oil and cuisine. Can I use it for cooking? And for frying? The most common use of extra-virgin olive oil is as a condiment in raw and cooked food. The flavours of the olive oil combine with those of the dish and the unique sensory characteristics of the olive oil come to the forefront, making a huge contribution to the finished dish. This said, the extra-virgin olive oil can be used also for cooking, as it has been commonly done in the Mediterranean culinary tradition in the preparation of tomato sauce or meat sauce for pasta, or in sautéing vegetables as well as in frying vegetables or fish. Natural antioxidant components protect extra virgin olive oil from thermo-oxidation at cooking and frying temperatures, thus avoiding the formation of off-flavours and loss of healthy properties. The olive oil smoke point (210°C) is much higher than the frying temperature, which is an essential feature of good frying oils. High quality extra-virgin olive (low in free acidity and oxidation indexes and well-filtered to avoid the presence of suspended material and excess water), is also perfectly suited for deep frying. The question is: does the oil flavour harmoniously combine with the flavour and taste of the fried food without overpowering it? If it does, extra virgin olive oil becomes a perfect frying medium. If it doesn’t, refined olive oil or other vegetable oils are a better option. Extra virgin olive oil and health. What are the benefits of including olive oil in our diet? It has been experimentally proved that a daily consumption of 15-20 grams (one or two tablespoons) of a good extra-virgin olive oil as a raw condiment of raw or cooked dishes, strengthens the immune system of our body and significantly contributes to the prevention of chronic diseases, including cardiovascular disease and cancer. This Good Dietetic Practice (GDP) can be recommended from weaning to the oldest age. Healthy properties are due to antioxidant and anti inflammatory components in a unique, peculiar mix of water-soluble polyphenols, and oil-soluble α-tocopherol (vitamin E), fitosterols, squalene, omega-3 and omega-6 fatty acids. In the olive oil producing regions of Italy, at the time of our grand-grand mothers, it was common practice to help puny children by giving them, every morning, a tablespoon of extra-virgin olive oil as such. There are serious reasons to think that they were right. Extra virgin olive oil and purchase. How can I choose a good olive oil if I do not know the producer? First of all, look for the “extra virgin” indication on the label. Extra virgin standards, defined by the European legislation, imply the authenticity and a high level of quality of the product. In the second place, look for a certified guarantee. Examples are the European PDO (Protected Designation of Origin), Organic Agriculture and many other public or private collective certification brands. Certification, in fact, requires a systematic control of the product. 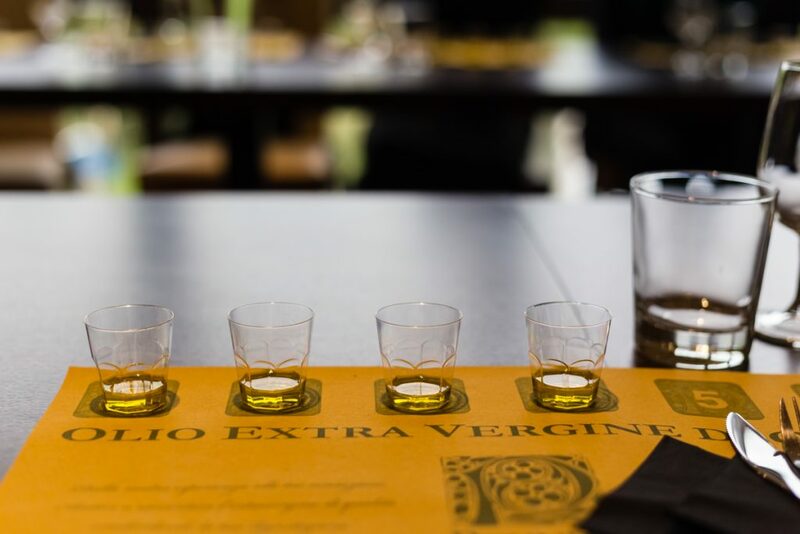 Evaluate the olive oil sensory performance according to your personal liking. Always try and compare extra virgin olive oils with different flavour profiles. When you find a good extra virgin olive oil, try to establish a contact with the producer (internet sites are usually quite informative, but direct contact is better). If the search ends by finding that your preferred extra virgin olive oils are produced by collaborative and trustworthy producers, you are lucky: buy and don’t care about the price! It is now time to give the floor to my second expert, Gionni Pruneti, olive oil producer in the Chianti area. 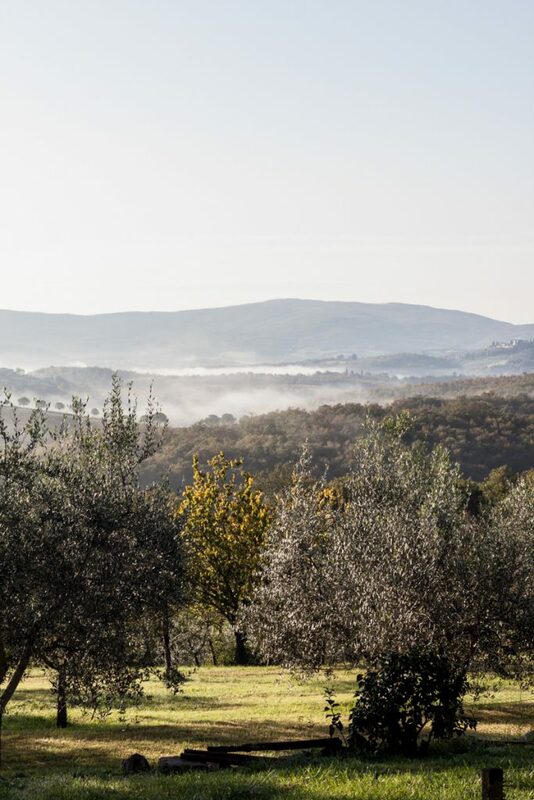 The Pruneti farm is run with passion by two young brothers, Gionni and Paolo, who have behind them the experience of a family rooted in Chianti and devoted to agriculture for over two hundred years. It was the beginning of the XIX century when Pasquale Pruneti, forefather of the family, began his activities as a farmer in San Polo in Chianti. Just let me add that this is not a sponsored post, I truly appreciate the passion and the honesty of the Pruneti family, as I am the biggest fan of their excellent olive oil, therefore I thought they could be the perfect speaker for this interview. Extra virgin olive oil and landscape. How much is it connected to the Tuscan landscape we know? The olive tree is one of the most important symbols of our region. If we think about a postcard from Tuscany, we would paint it with fields planted with olive trees, vineyards, wheat, sunflowers and iris. All basic products for our economy and protagonists of a unique landscape, known and appreciated worldwide. The relationship between nature and man fortunately can also be harmonious and constructive. We are very proud that the history of our family was born here, in these hills that represent the tradition of those who have been able to cultivate the land while respecting nature and the beauty of the landscape. In the recent years we witnessed a tendency to abandon olive groves leaving land uncultivated or to turn them into more profitable vineyards. Our company is going towards the opposite direction, increasing the olive area. The land and the olive trees give us emotions and connections to our roots and our history, energy for our future choices. For this reason, we continue to increase our olive groves and to prevent abandonment. Extra virgin olive oil and conservation. Which is the best way to store olive oil at home? The extra virgin olive oil is a fresh olive juice, rich in aromas, flavors and nutritional properties. How can we maintain the integrity of these elements up to the time of consumption? The principle is simple: oxygen, light and temperature deteriorate the extra virgin olive oil. A good choice at the time of purchase and proper storage are essential to make it last longer. We start from the choice of the bottle in which the extra virgin olive oil is stored. We should exclude transparent bottles and opt for dark glass bottles or stainless steel, which does not allow the light to to filter through. It is also preferable to choose as containers small size bottles rather than large cans because the latter, once opened, leave a greater surface area exposed to oxygen. At home, we should keep our bottle of extra virgin olive oil well sealed, to prevent the contact with air and the absorption of smells from the surrounding environment. It is even better to store the bottles in a dark environment. Another mistake to avoid: do not store your extra virgin olive oil near a cooking stove because the heat can damage it. Extra virgin olive oil does not like the heat nor the cold because both adversely affect its flavour. Finally, one important thing has to be clarified on the filtering. Often the residue at the bottom of the bottles is misinterpreted as a sign of a genuine and natural product. If the oil is just pressed the residue is irrelevant. But with time it is rather likely that an unfiltered extra virgin olive oil begins to age earlier because the internal substances trigger chemical reactions that oxidize the oil. So, unless you want to consume it in a short time, prefer a filtered extra virgin olive oil. Based on all of these factors, we can say that a well-preserved extra virgin olive oil will last longer. If an olive oil is of high quality and rich in polyphenols, over eighteen months. Extra virgin olive oil and food pairings. How can I combine olive oil and food? Matchings between food and extra virgin olive oil are endless. We invite our consumers to free their creativity in the kitchen, to experiment with their senses the combinations they prefer. The choice may vary according to the ingredients that are used, and also in relation to personal taste and flavours that we would like to create. In Italy there are over 700 different varieties of olives. 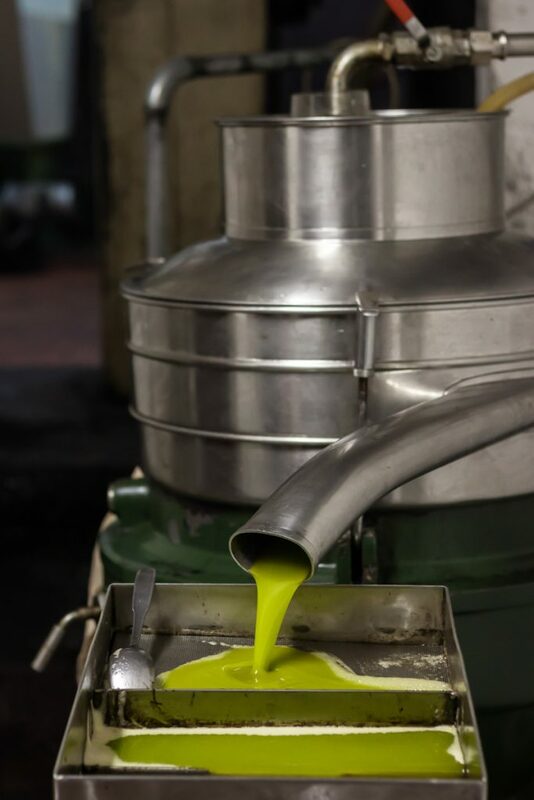 The olive oil changes according to the cultivars that are used and how they are processed. Our company produces nine types of extra virgin, three single-variety and six blend. Our single-varietal are obtained by the three most typical varieties of Chianti Classico and Tuscany which are Frantoio, Leccino and Moraiolo. Frantoio, for example, is an olive oil with remarkable bitter notes with a characteristic hint of artichoke and a spicy aftertaste of green pepper, ideal for red meat seasoning, such as the classic Florentine steak, or grilled vegetables and vegetables which enhances the flavour. Leccino instead is an extra virgin with very different characteristics, with soft and scented shade, of grass and vegetables. In this case, it pairs well with delicate flavours that enhances without overwhelming and is a delicious dressing to complex and spicy dishes or mature cheeses. For fresh cheeses instead, it is preferable Moraiolo, spicy and with its green and balsamic notes. It is also ideal for the pasta. The combination, however, depends on the type of pasta. For a stronger flavor pasta we might even dare a stronger Frantoio. And now, back to food! Carciofi ritti. Artichokes should be prepared with a good dose of patience, as you are supposed to clean them, removing all the tough outer leaves, and open them by hand, like a rose. 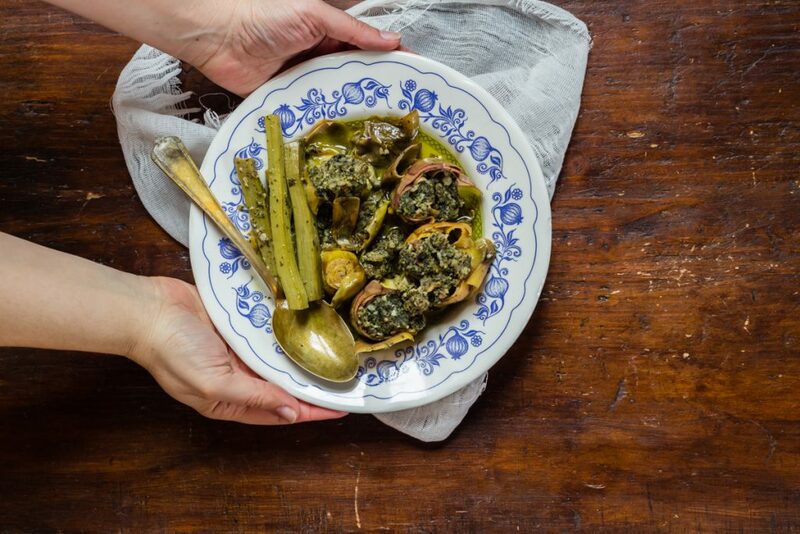 Then you stuff the artichokes with a battuto made of garlic, parsley, salt, black pepper and carnesecca, as you read in the old books of Tuscan cuisine. Use two slices of pancetta and chop everything by hand, on a cutting board. Spaghetti aglio e olio with slow-roasted tomatoes. Once the slow-roasted tomatoes are ready, you can store them in the fridge for several days. Add them to the most classic of the Italian dishes, spaghetti with garlic, olive oil and chilli pepper, for am easy and flavourful summer dish. Chocolate and olive oil clementine cake. It is an uncomplicated cake, comforting as a friend’s hug or a cup of tea in the afternoon. It has a soft and almost wet crumb, with a thin crisp crust. Look at it, it’s my cake. You can serve it with a dusting of icing sugar, which adds even more charm to its rustic look. Hazelnut and olive oil chocolate spread. A chocolate spread, especially if made with extra virgin olive oil, can be stored for some time and is a good idea for a gourmet Christmas gift. Make it precious with a beautiful handmade label drawn with old pencils in shades of brown, use a Christmas napkin to cover the lid of the jar and tie it with a velvet ribbon. A well document and extremely informative post, I have already shared it with friends and followers. I have been waiting for this post and thank you for the answers it brings. Too long have we been told that olive oil is not ok for cooking. I appreciate the history and the carefully considered work that went into this exceptional post. I am now dipping my home made bread in some olive oil so celebrate it! Traditionally we’ve been cooking with olive oil for generations, and I have finally a scientific explanation to it! previous post: The studio is open!